Ancient Stones - Borders - 039 Five Stones, Dere Street, Hownam. 039 Five Stones, Dere Street, Hownam. Five Stanes Stone Circle measures only 6.00m in diameter and stands in rough pasture on a slight rise to the east of Dere Street, near Hurkers Hill. The circle comprises five stones, none reaching more than 0.75m in height. Three of the five stones are standing and two are prone and three further stones have been displaced and can be found a few metres to the east. Two of these are visible and the third is at turf level. This site is best reached by following Dere Street, the Roman Road. Take the minor road running south from Hownam then head right for Oxnam. Dere Street is crossed at Pennymuir Forest, at the junction leading to Towford Outdoor Centre. On foot or by mountain bike, follow Dere Street north, past Trestle Cairn. The stone circle can be seen to the right of the track. Note that parts of the route are very wet and boggy and sturdy footwear is recommended. 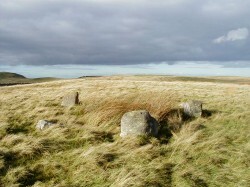 No specific folklore or other traditions have been found associated with this site as yet but one correspondent suggested that the stones have been referred to locally as the Shearers and the Bandster - the Shearers being the four stones forming the circle and the Bandster being the isolated stone to the south west. However, the same name has also been associated with a stone row known as The Shearers, some 4 miles away as the crow flies, near Hownam, and may apply there. The only problem is that there is no single stone that might be regarded as the Bandster. Perhaps Five Stanes Stone Circle is The Shearers and The Bandster? We may never know for certain. Don't be put off by the small size of this circle. What it lacks in size and grandeur, it makes up for by the sheer splendour of the setting, sitting high on windswept and exposed moorland. This site is well worth a visit. During the winter months a small peaty pool forms between the stones and the dark peaty soil gives it a bottomless and sinister quality. Try leaning over, close to the water, looking at your reflection, then imagine what lies hidden below. Interestingly, the 1st Edition O.S. 6" map of 1863 notes an area called the "Shining Pool" One wonders what meaning this might have, with reference to the stone circle. The 1st Edition O.S. 6" map 1863 shows two standing stones known as the Grey Mare and Foal, located on an area of land not far from the stone circle. The stones were apparently still in existence in 1899 but by 1923 the stones had vanished. However, an isolated boulder can be located at NT 7561 1702 but there is little evidence to suggest that it was associated with the 'Grey Mare and Foal' or that it is an antiquity. 038 Standing Stone, Chatto Craig, Hownam. 073 Standing Stone, Trestle Cairn, Hownam.